Why it matters: The Galaxy S10 features several new innovations never seen in previous iterations. The S10 doesn't just feature upgrades to the display, camera, and processor, but also new technology that companies have been racing to implement such as behind-the-screen camera sensors, fingerprint scanners integrated into the display, HDR10+ recording, and more that will set the S10 apart from the current generation of smartphones. Samsung unveiled the Galaxy S10 at Unpacked in San Francisco on Wednesday. After introducing its new folding smartphone, it dove right into its highly anticipated flagship phones. The Galaxy S10 features a full top-to-bottom, side-to-side AMOLED screen, which supports HDR10+. The bright 1,200 nits "Dynamic Infinity-O" display has a color gamut capable of 60 million colors making it highly vivid and color accurate. It can reduce the blue light emitted, making it easier on the eyes without using a filter or reducing picture quality. What is arguably more exciting about the new display is not so much what you can see, but what you can't. Samsung has finally achieved an on-screen fingerprint scanner. Several companies including Apple tried to embed fingerprint technology in the screens of last year’s devices but scrapped the idea when it could not be done in time. Now, Samsung has figured it out and will be among the first to offer such a feature. It accomplished this by embedding an ultrasonic sensor beneath the lower part of the display. When users press down, the sensor records a 3D image of their print. Samsung claims this makes it even more secure than traditional 2D scanning because it is harder to spoof the depth of the ridges. Another below-deck innovation is the front camera sensors. Gone are the notches and cutouts. The result is a true edge-to-edge display. Speaking of cameras, the dual-pixel, dual-aperture rear camera has an ultra-wide 123-degree field of view just like the human eye. “What you see, the camera sees,” says Samsung. The camera’s software is AI-driven and can analyze a user’s composition and make suggestions on how to improve the shot. The algorithm takes various aspects of the photo including lighting, objects in-frame and other data and gives on-screen advice on how to improve the picture before you snap it. In addition to great panoramic stills and AI enhancements, the camera uses digital stabilization while taking video for super smooth shots without post editing. And what good is that gorgeous HDR10+ display without a camera that can make the best of it? Both cameras can record in UHD HRD10+. Samsung has improved battery performance through AI as well. The Galaxy S10 will now optimize the 4,500mAh battery, CPU, and even device temperature depending on how you use your phone. The more you use it, the quicker it “learns” how to make components run efficiently. The company claims this innovation improves battery life up to 37 percent under typical usage conditions. It also has what Samsung is calling “Wireless PowerShare.” This feature essentially turns the phone into a wireless charging pad for your other devices like the ear pods and new smartwatch the company also unpacked today. To use it, users simply place the phone face down on a flat surface and then set their Qi-compatible accessory (or phone) on the back of the device. 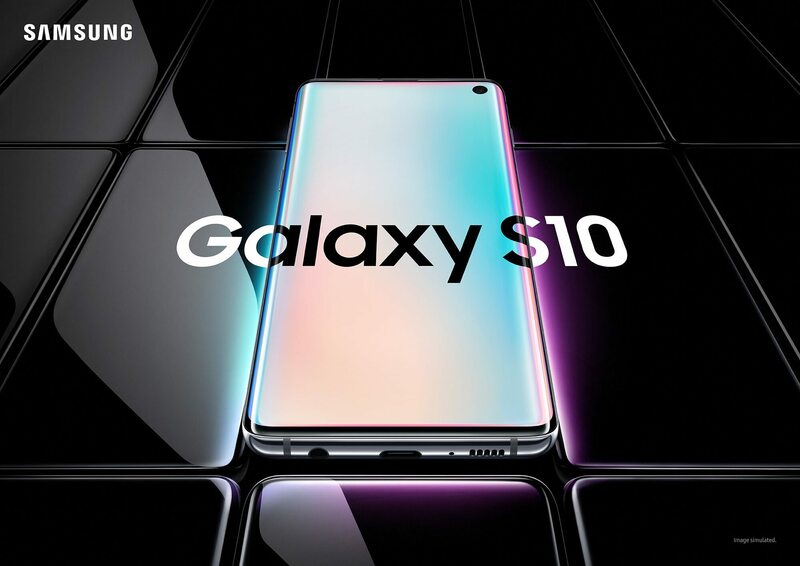 The newest flagship will come in three flavors — the Galaxy S10, the S10e, and the S10+ — in a wide variety of colors including ceramic versions in white and black. Storage options vary, but the S10+ offers the most potential with up to 1TB onboard capacity and a microSD slot for up to 512GB more. Check out Samsung’s website for a full list of specs and features. All versions will be available from most of the major providers starting March 8, 2019. Pricing starts at $899.99 for Galaxy S10, $999.99 for Galaxy S10+ and $749.99 for Galaxy S10e for both carrier and unlocked versions. Pre-orders begin Thursday, February 21 at 12:01 EST. To sweeten the pre-order deals, Samsung is offering a free set of Galaxy Buds ($130 value) to anybody placing orders between tomorrow and March 7.